Christmas of 2015 has come and gone and there are a few unfortunate visions that will always stick with me. The webcam images of the snow heroically built up then hopelessly lost under a staggering cocktail of rain and record high temperatures. Backyard thermometers showing night time lows well above historical averages for previous daytime highs. Sheets of rain and Christmas lights glimmering on the surface of a small river sweeping across my backyard, ultimately it formed its own little delta back there; nice enough if you live in bayou country but not my preferred Christmas time tableau. These are challenging days for anyone but river rats, and I think I might have briefly seen the flash of a paddle and the side of a kayak in my yard, or maybe it was a porpoise; the good news is that it carried off my lawnmower. It’s been a crummy year for sure, but this historically bad season has got me thinking about our history and the thing that holds us all together as skiers/snowboarders – OBSESSION. We would not be worried about, or stressing over, or charting, comparing, considering and cursing all this weather except for Obsession. I want to examine that and since I’m not skiing due to said weather, I may as well completely over think it. Family members gave me some vintage ski poles which I love but that also reminded me how far gone I am. People do not present you with poles made of bamboo and stitched leather with plate sized powder baskets, all in near perfect condition, unless they know you are obsessed. Of course they are right and given decent conditions I may actually use these. For the people living in the southern climes the greatest challenge was trying to escape huge swift and voracious predators, and in the north the challenge was slowly starving and slogging through chest deep wind drifts of snow while Thumper and Vixen scurried nimbly away chuckling all the while. As is so often the case in human history a game changing event was an accident; some millennia ago a Norse jogger was post holing, knee deep, along a miserable woodland track (that the local council had again not flagged!!) and he stepped on top of a neglected branch which miraculously supported his weight and held him on top of the snow… until it broke. Since that day all of the history of skiing has been rooted in the search for a better branch (and a better jogging path). The slow evolution went on for millennia, along the usual lines of innovation in the winter and day labor in the summer. 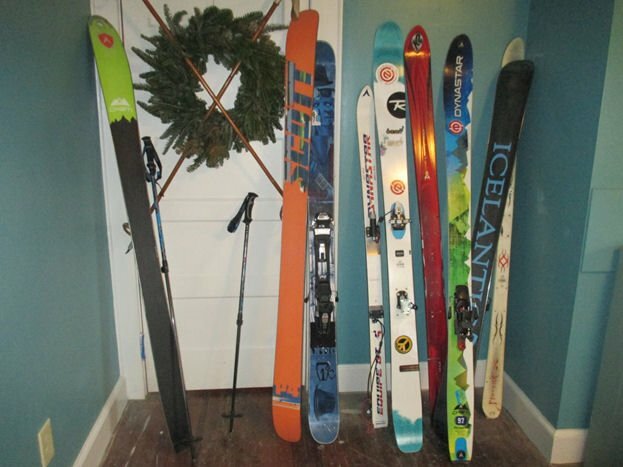 Until the day it finally found me staring at the skis behind a rental counter in Amarillo,Texas with my father filling out paperwork for five kids and two friends and no one on either side of that long desk knowing much about skis at all. But man I loved it right away; the smell; the metal, leather and wood; the tools, and rows and rows of boots and skis and utterly mysterious paraphernalia; a whole new geography. I also think I got my notion of tinkering with my own gear during that trip. My brother was 13 and I was 9; his friend, Jack, was also 13 but had skied at Steamboat (a snowy fabled land). We were at the less fabled Sipapu in New Mexico and while the shop techs back in Amarillo had presumably set the bindings to whatever the prevailing math was of the day, there in the cabin it was agreed that Jack would stand on my skis while my brother tackled me from various angles to test the bindings release values. And amazingly they were given or had stolen a screwdriver to actually alter the settings, which I watched with faith and focused admiration. A lot of the stupid things I do with bindings in my own shop now probably go back to that time. 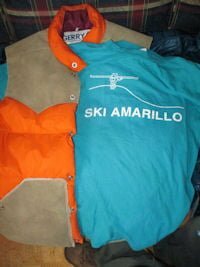 I loved those stores that optimistically rented out alpine gear on the high plains, sponsoring morning AM radio snow reports that had absolutely no relation to what was actually occurring in the mountains 4 hours away. Their reports were not rosy or false, just random, major trails were sometimes listed as being “rocky but passable”, “snow covered” sometimes came up in the report meaning the whole area was probably inaccessible. I moved on as any Gearhead would. A summer of lawn mowing and begging got me a pair of Dynastar Omeglass; which were like a holy grail, and considering that I had joined every church youth group in town that hosted a ski trip I knew something about holy grails. 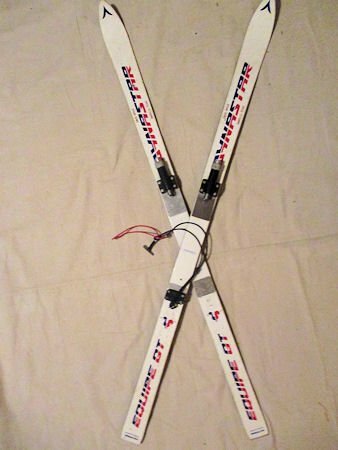 Anyway my theology notwithstanding, my thoroughbred skis saw only one trip, I had already succumbed to gear mania and had insisted upon, or been talked into the newest and greatest thing –ski brakes! No more leashes, freedom from all the dangers of being attached to your skis spinning around your head like helicopter blades. Free indeed, the epic powder of Wolf Creek swallowed them up like plankton on my first trip there; and despite all the efforts of patrol with metal detectors and even of a cute college girl trainee, they still could only find one. So in true Gearhead spirit, when I got home I immediately cut that one in half to see if it really did have the much touted omega shaped rib; it did, actually it was a pretty good idea. Despite that mishap, I stuck with the idea of ski brakes through eleven more pairs of skis which is a rather excessive number now that I add it up (I like to think I was integral to their continued viability.) That number would be even crazier but for the fact that I didn’t ski at all for a twenty year stretch which gave me a dramatic insight into the evolution of gear in the recent past. 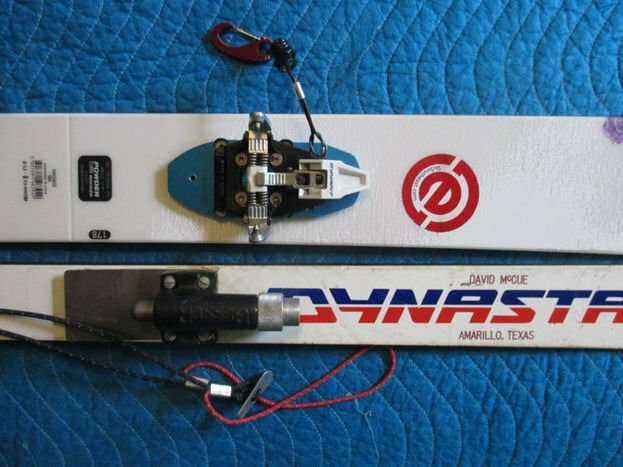 After those Dynastars going powder AWOL on me, I got a pair of K2 COMP 810s, which were the ski Phil Mahre was setting his World Cup records on. The orange color scheme worked well with the down vests of the day (Gerry of the day had a different meaning then) and since my only interest was going really fast and straight all the time these were about perfect. Remember the glory days of the tuck with obnoxious teenagers schussing everywhere on the mountain? 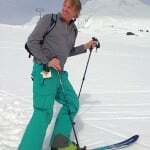 When I finally returned to skiing everything had changed, and vastly for the better. 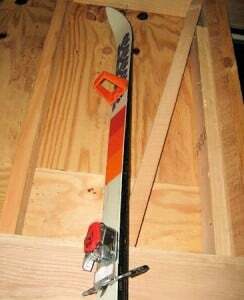 The new norm was shaped skis with true sidecut, turning was suddenly a lot easier and being a lot older that suited me just fine. Several years ago I did remount those nearly straight 190cm K2’s and fell more in an hour then I usually would in a week. Whatever stem christie technique I once possessed had long vanished and at lower speeds when you lean into a straight edge no turn initiates and you topple unceremoniously to the ground, or to the snow-flex in that case as my retro experiment was undertaken at Liberty University in mid-July, which I suppose is another mark of my obsession. 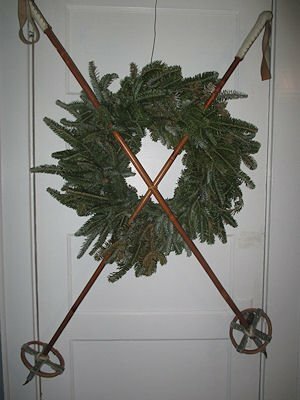 Pagamony, of SkiSE message board fame, now has those skis in his quiver (he’s no luddite just more well-rounded than me.) I basically use fat all-mountain boards everywhere now, my technique may have gone to hell but I’m always ready for my new obsessions, powder and untracked trees. And now it seems I have come full circle because forty years after my first pair of skis, this year I returned to the dreaded ski leashes. Apparently everything old is new again, I wonder if I still have my polyester bell bottoms hidden away somewhere? I hope you all had a great Christmas, and I hope you have something cool and new for when the snow finally falls, although old is good too. Gearheads unite, embrace the obsession. Previous articleNew Fans of Snowshoe Mountain on Sunday. Click to Enlarge!